Hand harvested grapes — 100 % destemmed but not crushed. Fermented in T-Bins. Cap manually punched down twice a day during fermentation. Minimal cold soak and 12 days total average cuvaison. Aged an average of 19 months in French oak barrels: 25 % new French oak. Bottled unfined and unfiltered on June 2nd of 2009. Released in July 2009. 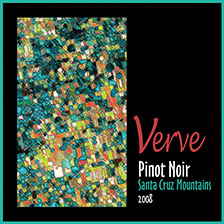 Plush and round, this Pinot Noir from the small Klein Family Vineyard in the Santa Cruz Mountains shows the depth and layers of mountain fruit, as well as the fresh deliciousness of the modern 115 and 667 clones planted in the vineyard. The wine explodes with juicy red and dark cherry flavors laced with the complexity of tea leaf and forest floor. The finish is long, with ultra-fine tannins, and notes of milk chocolate from the careful use of fine, tight grain French oak.